Aviation Updates Philippines - Low-cost carrier Philippines AirAsia will launch direct flights between Cebu, Philippines and Shenzhen, China on May 9, 2018. The airline opened reservations for flights between the two cities last week. NEW DESTINATION. Philippines AirAsia will launch direct flights from Cebu to Shenzhen on May 9, 2018. Photo by Dirk Salcedo - PPSG/AUP. Shenzhen will be AirAsia's first Chinese destination from the Queen City of the South. 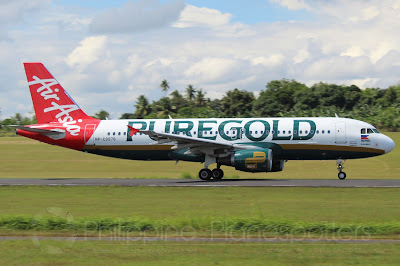 This will enable more Chinese tourists to conveniently visit the Visayas islands with the airline's newest connection to this major city in Guangdong province. “The addition of our first China route from Cebu hub enables us to further strengthen our network outside Metro Manila and open up new and exciting places to visit this summer,” Philippines AirAsia President and Chief Executive Officer Dexter Comendador said in a statement. The Chinese city is a modern metropolis that connects mainland China and Hong Kong. It is known for its shopping centers such as the Luohu Commercial City which features vast areas of retail stores — a major go-to place for tourists. “Cebuano travelers would be delighted to experience Shenzhen’s modern metropolis and marvel at how the southern city that links Hong Kong to mainland China built the world’s largest electric bus fleet, massive malls, contemporary buildings and amusement parks,” Comendador added. Flight Z2-7800 will depart Cebu at 11:35 PM and will arrive Shenzhen at 2:40 AM the next day. The return flight, Z2-7801, will depart Shenzhen at 03:34 AM and will arrive back in Cebu at 6:35 AM. According to AirlineRoute.net, AirAsia will be flying between Cebu and Shenzhen daily using its 180-seat Airbus A320-200 aircraft. With the six-month closure of Boracay island, Philippines AirAsia is reaching out to other domestic destinations to stimulate the continual growth of air travel in the country. The local industry is challenged to market other destinations to cope with the expected decline of tourist arrivals in line with Boracay's shutdown. AirAsia said more flights will be added from its secondary hubs in the Philippines. It will also ramp up its operations in major tourist and high-passenger market destinations. You can book the flight by visiting the website of Delta Airlines Reservations Official Site and compare the offers. You can book the tickets by visiting the website of Delta Airlines Official Site and buy it with comparing. If you want to lose in the beauty then you can reserve the tickets through Delta Airlines Reservations and reserve the tickets with beneficial offered services with comparing. With the help of delta airlines official websites, you will be able to book the tickets easily from your phone or your laptop. Catering to the needs of the air travelers, various Delta airlines reservations services of the booking of delta airlines tickets. Booking from Delta Airlines Official Site saves a lot of the precious time of the travelers. Online Air booking services from Delta airlines flights reservation is quite beneficial for the people who are looking for a pocket-friendly travel plan as they help you to decide upon the soundest scheme available. After collecting some general info about Delta airlines reservations. US Department of Transpiration has issued Delta airlines flights so you don’t need to think about authorization like important issues of the mentioned company. you can browse Delta airlines official site from where it will surely become easier for you to grab the best traveling packages. Now with the help of the internet, anyone can easily compare Delta airlines deals with some other available flight booking deals After checking the Delta airlines flights Ticket status of the mentioned company, you can easily get in touch with it without wasting your time. Read on to find the benefits of online flight booking particularly from United Airlines. One of the advantages of online international flight booking from them is the amount of money you can save with the help of a discount offer provided by united airlines official site.you can book united airlines reservations for domestic Air also. If you are looking for an easy way to book your united airlines tickets then the online booking option is far better than any other method. You will be able to book your united airlines flights simply with the help of a smartphone and an internet connection. Reason for a visit in this city most and it is of stunning beaches and cruises that visitors love and click the romantic pictures on them through united airlines. When you thinks about to spend vacation then book tickets through united airlines reservations Official Site and compare all the effective deals. You can book the effective united airlines flights deals.